In a review of the salary-cap situations of all 32 NFL teams this week, ESPN put the Oakland Raiders in the top “A lot of flexibility” category. The Raiders have the second-most room under the cap at more than $70 million, so general manager Reggie McKenzie will have plenty of money in his pocket if he chooses to compete for the biggest-impact free agents. The Raiders took that same approach last offseason, too, but in coming off a 3-13 season with a brand-new coaching staff in place, Oakland was far from a prime landing spot and McKenzie wasn’t able to land all the big fish he was pursuing. This time around could be much different. With a surging team (7-9 in 2015), some young stars (Derek Carr, Khalil Mack, Amari Cooper, Latavius Murray, Gabe Jackson) and a coaching staff and front office that appears to be solid, the Raiders may be able to land some immediate-impact stars by dangling big bundles of cash. “It’s starting to look like a legit up-and-coming club,” wrote ESPN in its analysis. So who might the Raiders pursue? Would Weddle Be a Nice Fit at Safety for the Raiders? 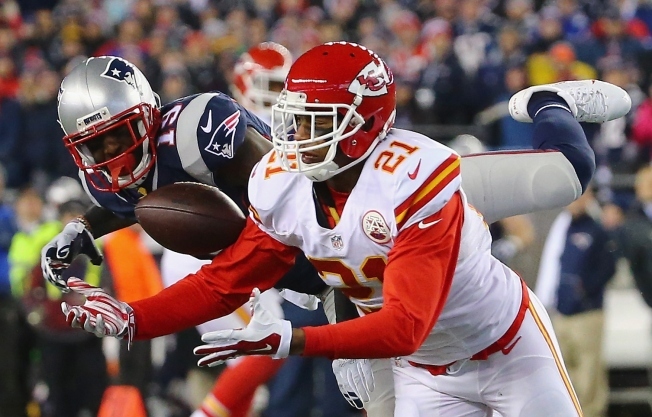 One possibility is Chiefs cornerback Sean Smith. At 28, Smith is in the prime of his career and has seven years of experience, the last three with the Kansas City Chiefs. The 6-foot-2, 215-pound former Utah standout, should he hit free agency, would likely be among the most coveted players available and any team will have to pay heavily to land him. Pro Football Focus has consistently ranked Smith among its top NFL corners the past few seasons. By adding Smith to its cornerback corps, Oakland would go into 2016 with a much more solid base to its secondary – one of its weakest links in 2015. It ranked 26th in pass defense among 32 teams last season. Plus, it appears Smith will be much more likely to be available now that it appears the Chiefs may put the franchise tag on safety Eric Berry, a move that would limit how much they can spend to keep Smith. And, as Sam Robinson of Pigskin.com noted this week, the Raiders would get a double bonus by landing Smith. “Acquiring Smith would pull the Raiders closer to the Chiefs, a direction they’re already heading in considering the choices the respective teams must make in the coming weeks,” he wrote. Plus, wrote Robinson, with so much money available, Oakland will also be able to spend on other top talent, even if it overpays for Smith.